Thanks to Relevant Children’s Ministry for this article on reaching Gen Z, the generation most of us our serving in our Crossroads Kids Clubs. Hope you find some of the insights in this article series helpful! 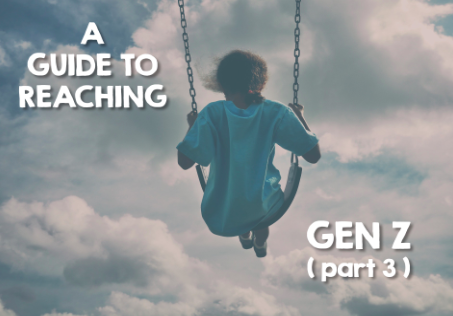 Today is the third installment of “A Guide to Reaching Gen Z.” We are looking at the unique characteristics and points of interests for Gen Z and how we can effectively minister to them. If you missed the first two articles, you can catch up by reading them at this link and this link. 1. Gen Z reflects the growing diversity of our nation. Each year we are becoming more and more diverse. Diversity has increased in 98% of all metropolitan areas and 97% of smaller cities since 1980. Census projections show that by 2045, caucasians will comprise 49.7% of the population, hispanics will be 24.6% of the population, blacks 13:1%, asians 7.9% and multi-racial will be 3.8% of the population. Idea: Make your church a place where everyone feels welcome. Reflect diversity in your staff, in your stage presence and in your congregation. Represent all races in your print and advertising pieces. Acknowledge and celebrate holidays for the nationalities of your congregation. Days like Martin Luther King Jr. day, Cinco de Mayo and the Chinese new year. 2. They communicate through images and video. For Gen Z, social media comes naturally. They have never known a world without it. 45% of Gen Z says they are almost always watching and monitoring content online. 41% of Gen Z kids spend 3 hours a day on their computer for non-school work purposes. This is up from just 21% ten years ago. Gen Z continues to move away from Facebook and toward Instagram, YouTube and Snapchat. In the first quarter of 2018, there were 191 million people who were daily using Snapchat to communicate. A big reason is these apps use pictures and video to communicate. Idea: Use as many social media platforms as you can, but first and foremost focus on Instagram, Snapchat and YouTube when communicating with Gen Z. Move away from words and toward pictures and videos. Think about how you can use these platforms to communicate to Gen Z by using pictures and videos. When you are communicating with Gen Z, remember this – visual content trumps written content. 3. They are less active. Rather than being outside playing, Gen Z spends a big percentage of their free time playing video games. 66% of 6 to 11 year olds lists gaming as their main source of entertainment. Idea: Install active play environments for your children’s ministry. And rather than having video games out for kids to play before service starts, replace the video games with hands-on, active games that get kids moving. It used to be that kids moved and played during their free time, so they engaged with video games if you had them at church. Now there is a shift happening. Since kids are online all week and are sitting most of that time, they are drawn toward active play, which gives them a break from the video game world they live in. Church can be that place. 4. Respond quickly. When they send you a message through social media, they want an immediate response. With increased internet speeds and the ability to be online anywhere and at all times, comes the expectation of quick response. Idea: Be quick when getting back in touch with Gen Z. Respond as quickly as you can. The quicker you respond, the more respect you will get with Gen Z. And for the ultimate response time, stream your info. in real time and take feedback, questions, etc. 5. Collaborate. Gen Z enjoys working in teams. When working with them, give them plenty of opportunities to collaborate with the people they are near to. Idea: Rather than placing a child in a seat that’s in a row, put him or her in a group that is circled up. Circles are better than rows when it comes to collaborating. In other words, your room structure is a reflection of your learning culture. And so we wrap up this series. I trust it has been an encouragement to you and provided you with fresh content, ideas and inspiration. May we continue to give our very best effort to reaching the next generation!